Today marks eight months that we lost our Izzie. She was known in our household by a myriad of different names... Izzie Bear, Izzie Girl and Nini, among others. It's amazing to me how much I can still miss her after all this time. She was a part of our lives for just a short time, but she made such an impact on our hearts. We will never forget her. As Halloween approaches, one of our most favorite holidays, I ask that you think of Izzie and all the light she brought to our lives. I know I will see her again one day, just like she was before she got sick. 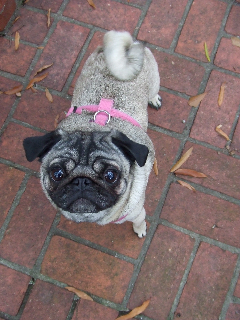 Here is a picture of her from December 2007. You can see what a little butterball she was back then! Thanks for the pic, Laurin. And she will always remember the happiness you brought to her life as well. We miss you Izzie! mI cannot believe it has been 8 months. I agree with Sheila - you gave Izzie a great life!